Last year I read 175 books, approximately 50,000 pages! Though many of the titles I read will be featured in more in-depth upcoming book reviews, I thought I'd break-down the list of everything I read this year in a series of posts over the course of January. 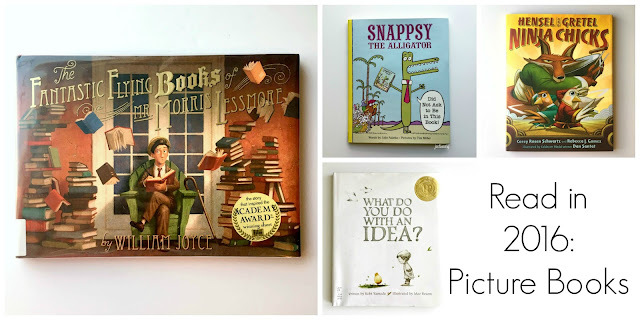 Today's post will highlight all 30 of the picture books I read in 2016. I've sorted them by genre and then by my Goodreads rating (a scale of 1-5 stars, 1 being I didn't like and 5 meaning it was amazing). This book actually brought a tear to my eyes. A beautiful story about the power of reading? Yes, please! Just a great read. Read my full review. So cute. The real story about how there came to be a bear in the London Zoo named Winnie who would catch the attention of a young a visitor named Christopher Robin and inspire his father A.A. Milne to write the beloved Winnie-the-Pooh tales. A lovely picture book about the value of children's imaginations. The pencil and watercolor illustrations are frame-worthy. Read my full review. A picture book adaptation of Leo Tolstoy's short story, "The Three Questions." A profound story about moral philosophy as questioned by great thinkers and yet still deeply meaningful here rendered with animal characters. A great message for adults and children alike. Encouragement for little kids, affordable therapy for grown-ups. Mo Willems in top form. Great illustrations, funny, and enjoyable for kids and their parents. The Berenstain Bears learn humility after judging their atypical neighbors Clem, Shem, and Lem Bogg. The audiobook version of this collection is fantastic. This is a good picture book for early picture book readers--it's one of the simplest Berenstain Bear books and the repetition and language predictability help kiddos become engaged in reading along. Plus, it's pretty awesome that Sister Bear is the best athlete in the family. Girl power! I love this Berenstain Bear story about Papa Bear because it's so similar to Winnie-the-Pooh. Picks up where Journey left off. The adventures here were a bit more fun to imagine than those in the previous book. A humorous picture book for to kids who are tired of their parents taking their pictures and posting them on social media. Read my full review. Lima bean farmers' propaganda disguised in a story of self-acceptance. I love, love, love wordless picture books. The story is simple--a bored girl uses drawing and her imagination to explore new worlds. It starts stronger than it ends, but I liked the concept. A brightly illustrated picture book about a boy riding the bus with his grandmother. Through their weekly Sunday rides, she teaches him about respect, life, gratitude, and community. Undoubtedly, the illustrations are the best part of this rebelling of the Brothers Grimm story. A Kung-fu animal retelling of Hansel & Gretel. I liked that in this version both characters are female and instead of being abandoned by their parents in the forest they set out to save their mom and dad. A fun, quirky premise but sometimes the plot and rhyme scheme felt forced and tired. Read my full review. Too preachy, even for a Berenstain Bear book, and rather boring. Brother Bear gets frustrated when a younger friend named Billy ruins his model airplane and obviously has to learn to be more kind and patient. If you like this book, it's likely due to the brightly colored and interactive (fold-out) illustrations and not the poorly written text. A cute, interactive picture book well suited for Kindergarten readers, just far too short. Read my full review. Miss Viola Swamp is still the best substitute teacher in children's literature, but it was funny that the kids thought their new teacher meant business when she showed up in designer jeans, hoop earrings, tinted glasses, and a sports car--so random. Papa Bear is a moron, bless him. Papa Bear is a moron, volume two. I'm not sure which was published first, but this book and The Berenstain Bears Shoot the Rapids are are basically the same story. Fun paper cuts but nothing revolutionary. Rhymes appropriate for early readers, but the concluding moral is a bit of an eye roll. An illustrated compilation of Goldilocks and the Three Bears, the Little Red Hen, and the Gingerbread Man. The Berenstain bears' name in the title is a bit deceptive. A publisher would have passed on this picture book if its author weren't so famous. I still don't fully understand the Olivia craze. Even though there's usually some sort of moral ending, she's annoying. Read the title, skip the book. Which pictures books did you enjoy reading last year?